I always love to do a fashion review of what I've worn on my vacation. The main reason is that I see too many "What to pack for vacation" posts that include the blandest clothing possible. People tend to want to pack light so they include a lot of neutrals and simple clothes that they can mix and match. I'm the total opposite. Yes, I want to pack light too, but I also know I'm going to be photographed a lot and those pictures will end up on Facebook, in a scrapbook, and will be seen for years to come, so I want to look good. When packing for Savannah I kept two things in mind: Comfort and Style. 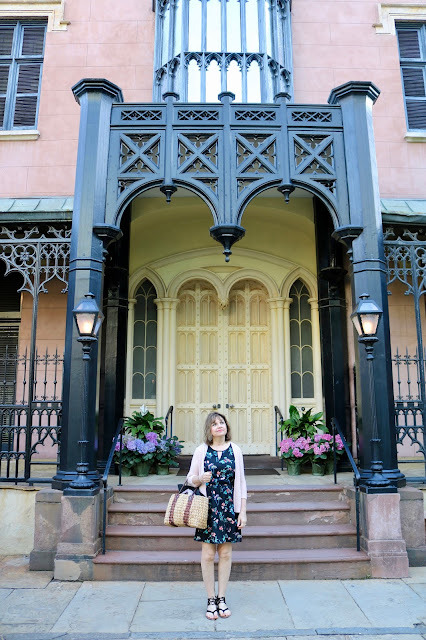 I wanted to take advantage of the photogenic beauty of the Savannah area so I chose clothes that were romantic and reminded me of the old south. But, I also knew it would be warm, humid, and I'd be walking a lot so I had to pack for comfort as well. First, I want to show you an outfit I wore in Savannah that I haven't shown you yet, then I'll review the rest of the outfits previously posted. This is a dress I received from Stitch Fix and previously shown in THIS POST. 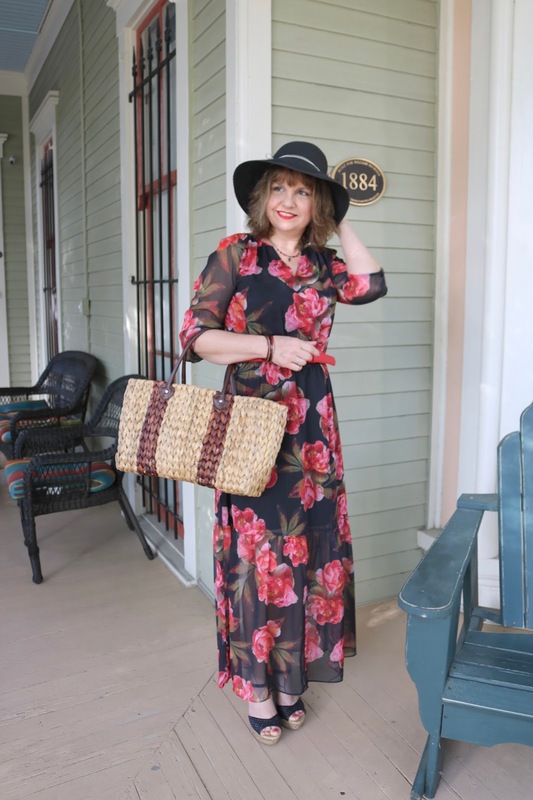 It's a very comfortable dress to wear as the fabric is lightweight and loose. The sleeveless style is great for layering and also cool when I choose to wear it alone. In the picture below it was early in the morning so it was a bit cool. I wore a thin blush cardigan that could easily fit in my tote when the temperatures increased later in the day. And here is the dress with sneakers. I obviously prefer the dress with sandals, but I'm happy it looks good with sneakers too. 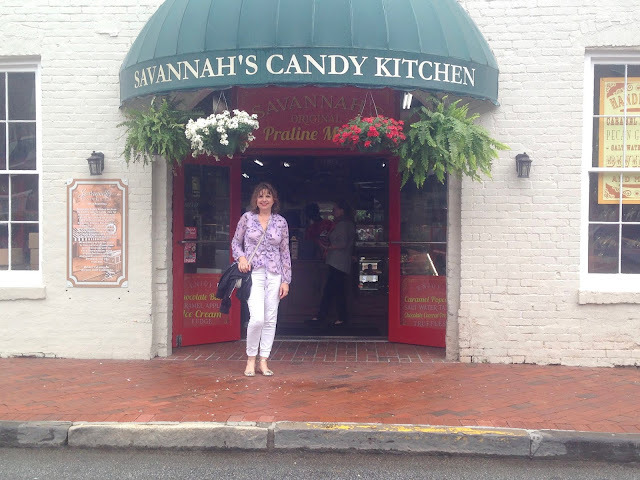 I carried this large straw tote all four days I was in Savannah. Most tourists carried back packs, but I find those annoying to get on and off every time I need something. Yes, this bag got heavy and cumbersome at times, but I'm glad I used it because it literally held everything I needed to get through the day. And now to review all the outfits I wore the rest of my vacation. A link to the original post is included at the bottom of each picture. My princess maxi dress by Disney. I wore this to the Tybee Island. It was perfect for a non-swimming day at the beach because the wind lifted up the long dress so it didn't get wet or sandy. A black floral maxi: this dress just screams "Savannah" to me! 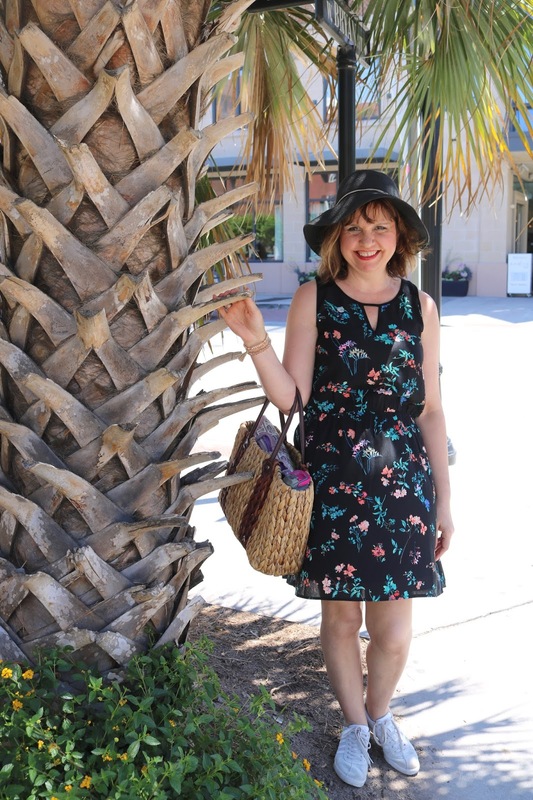 To keep the packing light, I picked only one sun hat from my collection: this black straw hat. It matched the majority of my outfits, that's why it was chosen. 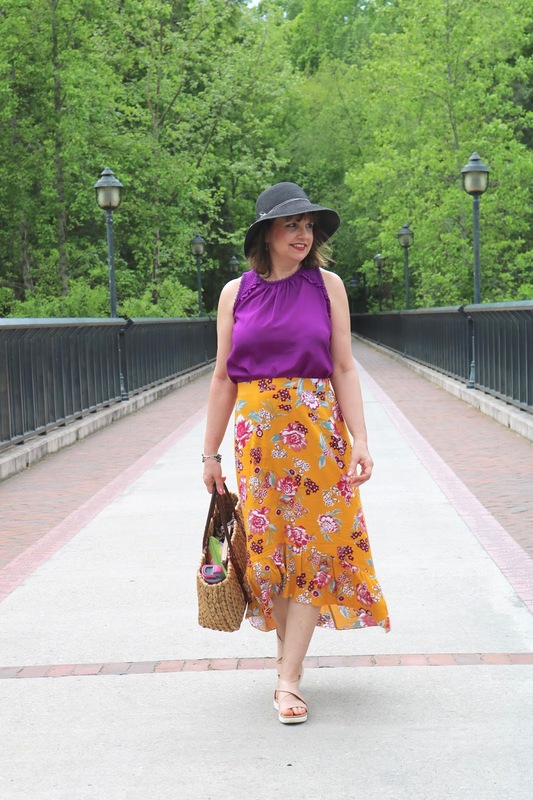 A mustard floral midi skirt with a purple sleeveless top. I walked all day on this day so I wore comfortable athletic sandals. 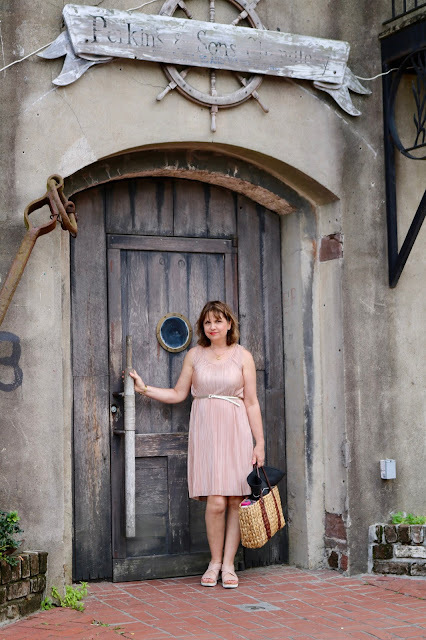 These sandals were on repeat and used again with my blush shift dress pictured below. 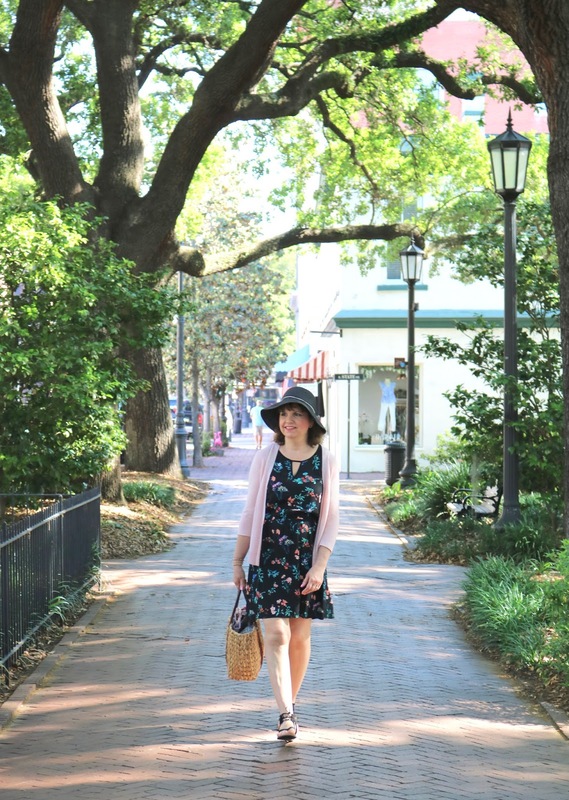 A lightweight blush shift dress with the same athletic sandals. White pants with a lilac floral wrap top. Which of these outfits are your favorite? How do you pack for vacations? I'd love to hear from you! That mustard floral skirt is fantastic! And the top on it has such a beautiful colour! Thanks Mica! That's so true about prints! I didn't think of that. I am just like you Amy. I can't handle the bland, neutral outfits that everyone markets for travel. I understand wanting to be smart about the clothing they take on vacation, but I still want to look my best. I love that you enjoy wearing so much color and dresses even on vacation!! Thanks Jodie! I know, right? I recently saw someone's post of what she packed for a trip to Italy and it was all jeans/sneaker type stuff for comfort. I was like "Are you kidding me? In Italy? With all that gorgeous architecture to photograph in the background and you want to be see in jeans, sweatshirts and sneakers?" haha! Not me! Lovely floral outfits you have here dear. They all look so breezy, and comfy, yet so chic and colorful! So pretty on you! The dresses are all gorgeous and fit the surroundings so well! I love the first one especially because it's my favorite lengths in dresses and I love the cut. Thanks Ellie, I must admit that although that dress is the less beautiful or striking as the rest, it's the one I get the most use out of because it's so wearable and comfortable. I like how you pack! I think I generally pack like you do for vacations, but I went a little more dressy for this vacation because of the location. Thanks Anna! I love those maxi's too! You always look so cute, nice and friendly in whatever you wear. Everything looks great on you Amy! 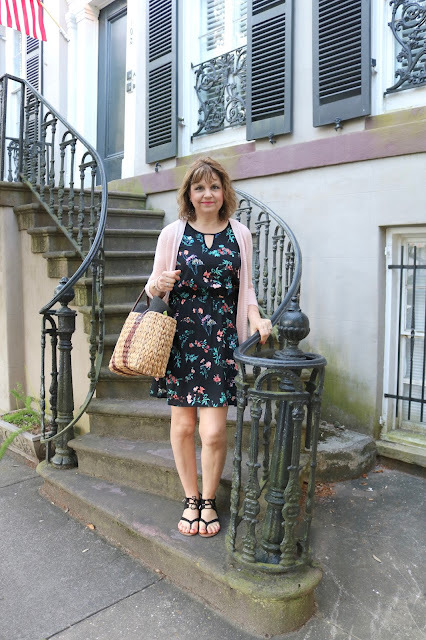 Love the fun floral dress on you, it looks great with sneakers and your pretty sandals. My hubby and I love Savannah, just a lot to do and great history! 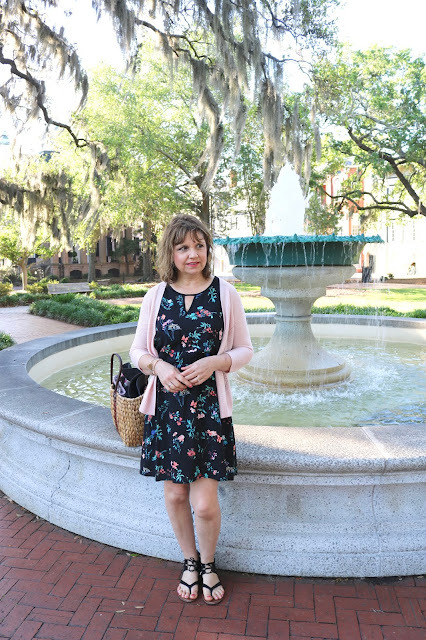 I love all the floral looks Amy!! I’d love for you to join our link up today!